"I decided on a whim yesterday that I wanted to make cupcakes for Canada Day. I didn't have time to buy frosting before getting ready for the fireworks show, so I ended up making my own with ingredients I already had. I was shocked at how quick and easy this was! 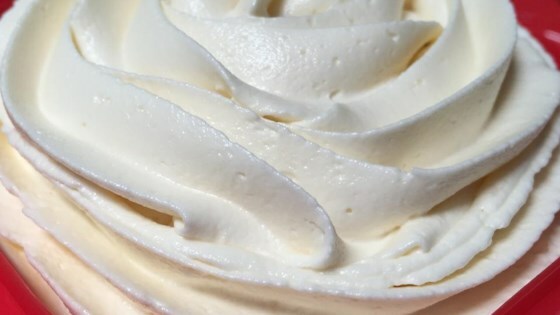 This basic vanilla recipe makes enough to cover a dozen cupcakes, but feel free to double it (for cakes), triple it, add food coloring or different flavor extracts. If you find this too sweet, you can add a dash of salt to the milk or the vanilla. Personally I like it sweet, and I used salted butter, so I didn't find it necessary." It was not too sweet for me and it was super easy to make... i added chocolate chips in my icing ... id like to try using more of the butter than the shortening next time. I tried this recipe on a whim and I am very pleased with it. I made it exactly as written and it made enough to frost a 13x9 cake nicely.